Richard and Lydia Pilcher and their two baby sons embarked from England on the sailing ship Stirlingshire in 1882, via the Cape of Good Hope to the port of Townsville where Richard soon owned a small business as a general blacksmith and built and invented an efficient scarifier which was exhibited in the Townsville annual show. Richard was enterprising and industrious. After establishing a successful farming business in the Ayr District, the family moved to the Deep Lead Goldfield near Cape River. Richard and Lydia took up land six miles from Pentland and the farm they established became the foundation of the several properties which were later worked by their sons. Pentland is a town in north-western Queensland between Charters Towers and Hughenden, 240 kilometres (150 miles) from the North Queensland city of Townsville. The Cape River rises in the area. Mr and Mrs Pilcher stayed on their selection with their family till they died, Richard in 1939 and Lydia the following year. They were well known in their local community, notably hospitable, musical, involved in church and school activities. The family included seven sons and three daughters. 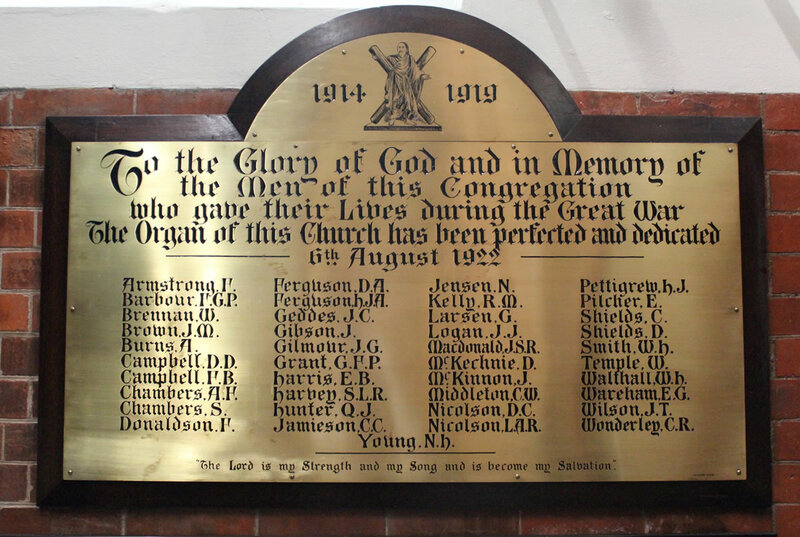 The names of their four sons who served in the Great War appear on the honour boards in the Soldiers Memorial Hall at Pentland and Saint Andrew’s Uniting Church in Brisbane. The two older brothers, Algernon and Ernest came to Brisbane as ambulance officers and were members of Saint Andrew’s Presbyterian Church. They enlisted to serve in the Australian Imperial Force in 1914. Their two younger brothers, Leon and Percy enlisted in Charters Towers in January 1916 and began their training at Enoggera before embarkation later that year. Ernest Pilcher was 24 years and 9 months old when he enlisted for overseas service with the Australian Imperial Force on 8 September 1914, just three weeks after the outbreak of war. His home town was Pentland, North Queensland and in 1912 he was a communicant member of Saint Andrew’s Presbyterian Church, Brisbane while he worked at the Ambulance Brigade in Ann Street. He was working as an ambulance bearer in Rockhampton when he enlisted. Private Pilcher, Service Number 55, joined the Army Medical Corps, having had previous knowledge of first aid and nursing. His unit, 3rd Field Ambulance A Squadron, embarked from Brisbane on board Transport A22 Rangatira on 25 September 1914. He was in the landing at Gallipoli where he was wounded through the left shoulder. He was sent to hospital in Egypt for about five weeks and returned to Gallipoli where he remained until the evacuation. Ernie went to France with the rest of the Australians where he drove an ambulance motor. He was gifted with musical ability and he was transferred into an Australian Divisional Supply Column (motor transport) where he was able to further his talent for music by joining both its band and its orchestra. “I feel that I must write to you on behalf of the members of this unit to express our deep sympathy with you in the death of your son, Driver E. S. Pilcher. No doubt you would like to know some of the circumstances surrounding his last few hours. The night before his death he was one of the drivers on a lorry detailed on special duty in the forward area. “While parked up waiting for orders the enemy commenced shelling the place where they parked, forcing them to move their lorry to another and seemingly safer spot, but again the enemy located them and fired another salvo round their lorry, this time wounding your son and three other drivers who were with him. “Your son was placed on an ambulance after having first aid treatment and taken to the advanced dressing station in the vicinity. Everything possible was done for him but I am sorry to say that he died before reaching the next dressing station. His death took place about 3 am on the 25th of June. He was badly wounded in the head and chest. He was buried that morning close to the dressing station and I am having a cross made with his name and particulars inscribed on it, and which will be placed over his grave to mark the spot where he lies. 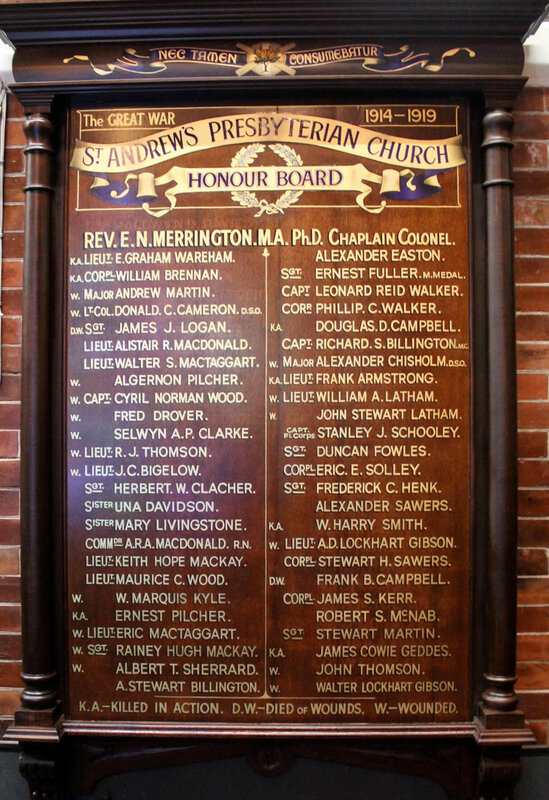 E. S. Pilcher’s name appears on the Presbyterian Honour Board at Saint Andrew’s Uniting Church. Brisbane. His name is also on the Pentland and District 1914-1918 Honour Board in his home town in North Queensland. It is in the Pentland Soldiers Memorial Hall erected in 1926 in memory of those soldiers who paid the supreme sacrifice during World War 1. The Soldiers Memorial Hall was officially opened on 24 April 1926 by Mrs Pilcher who received an inscribed cup from the Pentland residents as a memento of the occasion. Mrs Pilcher was the mother of four sons who had gone to the war with one son paying the supreme sacrifice while recovering from his war wounds in France.